Hunt on for the site of the world’s first thorium-based plant. But is it safe? INDIA is ready to build its first large-scale, thorium-fuelled nuclear power reactor. A radioactive element, thorium is considered safer than conventional nuclear fuel uranium. The Advanced Heavy Water Reactor (AHWR), to be built by Bhabha Atomic Research Centre (BARC), will be the world’s first. While the design of the experimental reactor is confirmed, BARC is finalising its site. “Construction will begin as soon as site inspection is over and statutory approvals are granted,” says Ratan Kumar Sinha, BARC director. The project will be completed in six years, he adds. The reactor will have 300 MW capacity. It is expected to consume about 12 tonnes of thorium annually. India has one of the largest thorium reserves; about 0.63 million tonnes, according to the Department of Atomic Energy (DEA). “So it makes sense to have such reactors,” says Sinha. 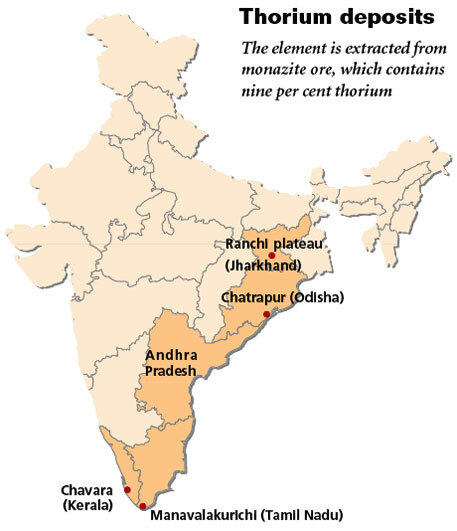 Thorium is extracted from monazite ore, found in beach and river sand (see map). It has significant advantages over uranium. In nature, thorium occurs as thorium-232, which is not fissile (capable of sustaining a chain reaction of nuclear fission). It has to be irradiated with fissile uranium, uranium-235, or plutonium-239, to turn it into fissile uranium-233. “The conversion of thorium-232 to uranium-233 is three times faster than that of uranium-238 to plutonium-239,” says Sinha. In conventional reactors, fissile uranium-235 or uranium-238 gets converted into plutonium-239 to produce power. It is widely reported that thorium plants are safer as their end product is not plutonium, as in the case of conventional plants. Plutonium is widely used in nuclear weapons. This minimises the chances of weapon proliferation. But Arjun Makhijani, president of Institute of Energy and Environmental Research (IEER) in USA, is not convinced. “The naturally occurring uranium ore contains 0.7 per cent uranium-235, which needs to be enriched to irradiate thorium. This enriched form can be used to make nuclear weapons,” he says. Besides, byproducts of the use of uranium-233 include highly radioactive isotope, uranium-232. “These challenges are being addressed by DEA,” says Sinha. There are other concerns too. No technology has been tested so far to prove the commercial feasibility of thorium-fuelled reactors. China, Japan, USA and the UK have announced plans to build thorium-based power plants but are yet to move ahead. But BARC claims to have generated enough data during the past five decades to prove that thorium can be used in a commercial and sustainable way. Since safety is the most pressing issue in nuclear plants, BARC says it has taken the best safety measures. These include use of natural circulation of coolant that transports heat to deal with shutdown conditions and station blackouts. The thorium reactor will take India close to the third phase of its Nuclear Power Programme, which started 40 years ago. The ongoing first stage uses uranium in Pressurised Heavy Water Reactors. The second stage will be demonstrated by the plutonium-fuelled Prototype Fast Breeder Reactor in Kalpakkam in Tamil Nadu. It is expected to start in 2012. M R Srinivasan, former chairperson of Nuclear Power Corporation of India Ltd, says generation was forecast to touch 20,000 MW by 2020, but the expected installation is 15,000 MW. Thanks for the article but what about long term storage of the waste from the thorium cycle? What is the technological bottleneck with Thorium cycle right now? Is Thorium breeding not similar to Plutonium-239 breeding from Uranium-238? So, if latter is commercially being done, what is the major issue with former? "The conversion of thorium-232 to uranium-233 is three times faster than that of uranium-238 to plutonium-239,Ã”Ã‡Ã˜ says Sinha. than that of uranium-238 to plutonium-239.